I recently released shinydashboardPlus on CRAN. Therefore, some of the functions below are now included in the package. Find out more on github. 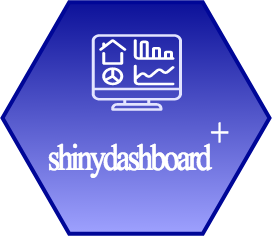 shinydashboard is without any doubt a great package. Even though built upon the famous free adminLTE2 dashboard template (boostrap 3), most of the dashboard I see almost look the same. In the shinydashboard package, some adminLTE2 components are not implemented such as the right sidebar, which can be extremely useful: contains input, parameters, … But everything you need is hidden under the hood, in the inst/AdminLTE folder (shinydashboard github). In the following, I will show you how you could implement any of the adminLTE2 elements, when they are not already included in the shinydashboard package. Before going deeper in the adminLTE2 features, it is crucial to understand what does shiny! animation = "pulse", status = "info"
What to do if you find an interesting HTML object (boostrap 3 compatible) that you want to integrate in your shiny app? Before going further, make sure that the adminLTE2 source code is available somewhere on your computer. You can download it from here (version 2.4.2). You noticed a timeline element that you really want to include in your shinydashboard. According to the following screenshot, open the profile.html page with your favorite editor (notepad ++, Rstudio, Xcode, …). We are more like Germany, ambitious and misunderstood! Congratulations!!! Actually and in my opinion, if you write a shiny app, it is more consistent to write everything in R and not mix HTML and R, or at least not too much. Below, I explain you how to translate this HTML code in R.
For this part, I will take the HTML code corresponding to a social box from adminLTE2. To convert it into R, we will use the tags function from the htmltools package (shiny also includes it). Each HTML5 tag will be preceded by tags such as tags$h5("an example") or tags$div(class = "col-sm-4"). Anyway, if you enter tags$ in the console, a list of all valid tags will appear (and I have no idea of the total number). where you would have some fields such as username, userposition, sales, followers and products. I use the withTags function that enables me to remove tags$ (lazyness :)). From now, you should be able to integrate any boostrap 3 compatible objects in your shinydashboards. In this part, I explain how you could improve the box function that is already available shinydashboard::box. buttonStatus <- status %OR% "default"
The box function from shinydashboard package already contains the collapsible button (if the collapsible argument is TRUE). Finally, do not forget to replace collapseTag by boxToolTag in the box headerTag headerTag <- div(class = "box-header", titleTag, collapseTag) (the final code is at the end of this section). Besides, you should add the closable argument to the argument list (closable = TRUE by default). I have a good (or bad) new for you: this was just the warm-up! What do you think about adding tags to the boxToolTag? You should also add the label_status argument to the argument list of the box function! To finish this tutorial, I have some suggestions to radically pimp your dashboard design. A version very similar to adminLTE2. By chance, a shiny implementation is available here, developed by Mark Edmonson. This template looks really promising! Below a demonstration of an app I am currently developing for an external project (it is unfortunately in French). Recently released on CRAN by the Appsilon data science group, this upcoming package seems a very interesting alternative to shinydashboard. It relies on the semantic UI library, for wich shiny.semantic is also available. Semantic dashboard looks very clear but terribly efficient. What I really enjoy is that you only need to change library(shinydashboard) to library(semantic.dashboard) in order to convert any shinydashboard to the semantic design. Besides, you can add any of the semantic themes (make either light or dark dashboard), which you cannot do with shinydashboard. Amazing!!! Material design to build shiny dashboards. Download shinymaterial from here. A dashboard example is available here.